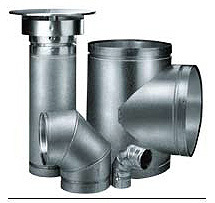 B-vent system for use with gas stoves, inserts and fireplaces equipped with an atmospheric or forced air burner. Use the form below to request more information on CG - Gas Vent Type B, and a Kastle sales rep will get back to you as soon as possible. Fields in red are required.